The name of a local civil rights leader in the US northwest is trending worldwide after her parents told the media that she is a white woman who has been passing herself off as black for years. When I met Rachel Dolezal, I found it easy to accept her description of her ethnicity. Along with BBC correspondent Jonny Dymond, I talked to Dolezal in 2011 in a coffee shop in Spokane, Washington, while producing a BBC World Service documentary on a surge in extremist militia activity in America. She told us that she was of mixed racial heritage but that she primarily identified with her black ancestors. She matter-of-factly listed the abuse she says she received at the hands of racists, including threats, break-ins, and nooses being left at her workplace. At no time during our hour-long interview, or during a number of phone and email conversations before and after, did Dolezal give any cause to doubt her heritage. 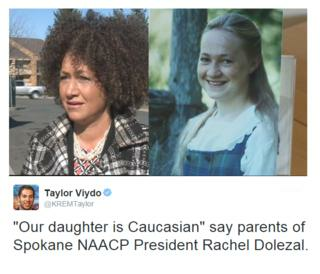 But today Dolezal, a well-known local civil rights leader, university lecturer and head of the local chapter of civil rights group NAACP, is being talked about across social media networks, because her family have said she was lying about her background. Dolezal's parents told local media the family's ancestry is Czech, Swedish and German, with some Native American heritage as well. Her parents say her African-American "son" is actually her brother, who was adopted by the family. When a local TV reporter asked her whether she is African-American, Dolezal said she didn't understand the question, and walked away. Dolezal also seems to have also avoided directly answering questions posed by a local newspaper, which reported that she put the controversy down to a legal dispute between her and her parents. Dolezal's name became a worldwide Twitter trend Friday, with more than 100,000 tweets mentioning her. Many African-American activists were outraged. "Don't talk to me about how #RachelDolezal understood/knew the Black struggle when she could pick & choose when to be 'Black'," says Kim Moore, while Broderick Greer commented: "Only a white person could get this much attention for being black. :)". Others compared Dolezal's story with the discussion around transgender issues, especially the example of Caitlyn - formerly Bruce - Jenner. Soon the hashtag #transracial was trending. Some were using it for jokes and satire, but others were making serious points. "People mad about RachelDolezal claiming to be black but you guys ok with Caitlyn Jenner. Make up your mind," tweets @PerfectLegend. Many users found the comparison wrong or even offensive: "There is nothing 'trans' about #RachelDolezal. Stop w/ the false equivalencies to transpeople. Rachel is a lying, deceitful fraud. The end." says @ReignOfApril. BBC Trending has tried to contact Dolezal, but she hasn't yet responded. Update: An earlier version of this story contained a quote from a satirical tweet, which we've removed.